Our custom made waste baskets are a perfect addition to your room! Make it easy to dispose your trash in every room. Since each waste basket is custom made just for you, you can coordinate it with each of your rooms! These waste baskets are a beautiful and elegant oval shape that is tapered from top to bottom. They are made of a sturdy plastic and are available in black or white. They hold approximately 1.75 gallons / 7 quarts and measure at about 7" x 9" x 11". They are the perfect slim size to place in a corner, under a desk, or in a bathroom. Although they are slightly smaller than the average waste basket, they are the perfect size to use in any room. Our wastebaskets are made by applying your custom printed and cut vinyl sticker. You can choose to get stickers on the front of the wastebasket, leaving the back blank or to get stickers put on both the front and back. Our stickers are made from a high quality gloss vinyl, are printed with eco-solvent inks, and are cut precisely by a machine. Thus, they are completely waterproof and will not fade or deteriorate easily over time. We have hundreds of designs to choose from! Many of our designs are available in multiple colors and backgrounds. As always, the choice to add text / personalization on our products is yours - so, add a ribbon, a label, some personalization or just select a pattern. Change a little or change it all! The choice is yours. If you ever find trouble in our design center be sure to contact us so we can help! 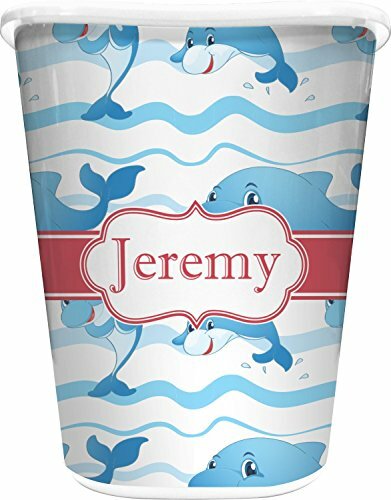 If you loved this wastebasket you will be sure to love our whole Bathroom selection! Within this department you will find everything from bathroom accessory sets to unique shower curtains! Maybe even grab a cute toilet seat decal while you're at it! Hello Kitty Letter Dust Bin Swing Type Wastebasket Trash Can 13"